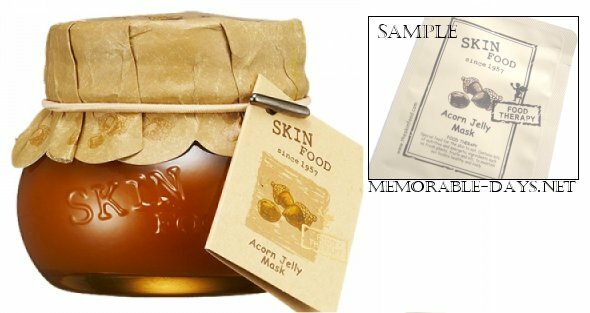 Review: Skinfood Acorn Jelly Mask | Memorable Days : Beauty Blog - Korean Beauty, European, American Product Reviews. Today I'm going to review the Acorn Jelly mask of Skinfood. There was a sample of this product in the surprise package that I received the last time, so I tried it out. It's a mask that effectively tightens oil-clogged enlarged pores and exfoliates the layers of dead skin cells with powdered acorns from Jiri-mountain. One jar is quite expensive. YESSTYLE is selling it for $30, 100 g jar. The packaging looks cute though ^-^ it makes me think of a honey jar. This mask has a firm jelly-like texture. When looking at the color it made me think of honey. I can't really describe the scent =/, it doesn't smell good and it doesn't stink, it's just ok.
After washing your face, apply an ample amount onto the face and massage it gently. You only have to leave it on your face for 1 minute! When it's time, rinse it off with lukewarm water. YES only 1 minute xD I'm used to put masks on for at least 20 minutes, so 1 minute is really quick, but it's great for people who don't have much patience and/or time. I've tried this product 3 times. (My skin type is combined.) I have an oily T-zone and medium large pores on my nose, so I was excited to try this ^__^ I applied the mask on my T-zone and my chin and rinsed it off after 1 minute. What i liked about this product is that it tightened my pores and it also removed the oil on my skin. However, it made my skin very DRY >.<", so I guess that it wasn't suitable for my skin =/ and I think it's just way too expensive, so I'm happy that I only tried a sample of it xD. I wouldn't purchase the large jar.